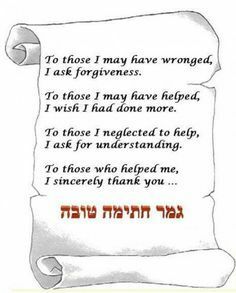 To those I have wronged – I ask forgiveness. To those I have helped – I wish I had done more. To those I neglected to help – I ask for understanding. To those who helped me – I thank you. Yom kippur. It’s a day of forgiveness. Of re-connection. Of return – return to what??? To all those I have offended, hurt or embarrassed this year. Think very hard about why I did that to you. It is not too late for you to apologise. Yom Kippur. It’s a day that’s meant to wipe the slate clean so that we can start anew/afresh. I loved this post on what that means. I think to each of us it’ll mean something different. The primary person I have to forgive is myself. For being me. For existing. For struggling. For everything I blame myself for. Forgiveness. Once I can forgive myself I can forgive the world for existing. I can forgive god for creating me. I can forgive the world for the pain of being here. This world is a beautiful place. An overwhelming place too, but beautiful. We just have to see a sunset to know that. Or watch a sunrise. Or see the sun peeking between the clouds on a stormy day. To realise how awesome it is. To be reminded that the storms will pass and that god is always with us. I’ve gained a lot this past year. It’s hard to see and hard to appreciate just how much when I’m struggling. At the moment I’m calm and I’m grateful for that. Grateful that however overwhelmed I am, I can still be with a sense of okayness. I’m grateful for all I’ve learned this year. I look back at the year and see the stability I have with the awareness of god’s presence. The understanding I have of god, and the world, which I’m so grateful for. I look back at the year. At the mistakes I’ve made. At the good things I’ve done. I can look back. And know that I can forgive myself and love myself for being me. Connection to myself and to god and the world. I’m always putting myself first. I feel like in order to forgive, to reflect, to connect, to love, to give, I have to be whole. It’s like pouring water into a cup. If the cup is cracked, no water can go in it. If I can’t have a relationship with myself, I can’t have a relationship with god. If I can’t be okay with myself I can’t be okay with the world. If I don’t feel safe within myself I won’t feel safe within a world. Connection. It’s Yom Kippur soon. I’m grateful to be here. Grateful for all of you who are here. Grateful for anyone who is a part of my life and the parts you play in it. May the coming year be one of serenity, connection and knowledge for us all. May the coming year be one in which we learn to love a life we live and live a life we love. Sidenote: I just came across a blogpost I really liked – linked here. She quoted some really nice ideas to make the day meaningful. I love the thought of wiping the slate clean. Such a beautiful and wise way to forgiveness. I wish more people would do this. Just think how happier we would all be. This is a beautiful post, with lots of food for thought. I wish you a year (not just a year, a life, until 120) of good health and serenity, peace, safety, and connections with people, with nature and with G-d. Thank you too for your kind link back to my blog. Gmar Hatima Tova, may you be inscribed in the book of life. :) I actually just edited the post to link to another blog post and facebook page. Hope this year brings lotsa serenity your way.